§ 61.77 Special purpose pilot authorization: Operation of U.S.-registered civil aircraft leased by a person who is not a U.S. citizen. (2) For carrying persons or property for compensation or hire on that aircraft. 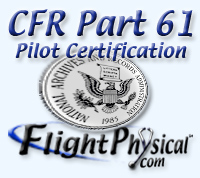 (iii) Stating that the applicant has received ground and flight instruction that qualifies the applicant to perform the duties to be assigned on the aircraft. (6) A statement that the applicant does not already hold a special purpose pilot authorization; however, if the applicant already holds a special purpose pilot authorization, then that special purpose pilot authorization must be surrendered to either the FAA Flight Standards District Office that issued it, or the FAA Flight Standards District Office processing the application for the authorization, prior to being issued another special purpose pilot authorization. (2) Must comply with the limitations specified in this section and any additional limitations specified on the special purpose pilot authorization. (5) If the holder has only one special purpose pilot authorization as provided in paragraph (b)(6) of this section. (4) Scheduled international air services, or nonscheduled international air transportation for compensation or hire, in airplanes having a payload capacity of more than 7,500 pounds. (1) International air service, as used in paragraph (e) of this section, means scheduled air service performed in airplanes for the public transport of passengers, mail, or cargo, in which the service passes through the air space over the territory of more than one country. (2) International air transportation, as used in paragraph (e) of this section, means air transportation performed in airplanes for the public transport of passengers, mail, or cargo, in which service passes through the air space over the territory of more than one country. (3) Scheduled international air services carrying passengers in turbojet-powered airplanes having a passenger-seat configuration of 1 to 30 seats. (4) When the person no longer meets the medical standards for the issuance of the foreign pilot license. (2) Surrenders the expired special purpose pilot authorization upon receipt of the new authorization. (j) Surrender. The holder of a special purpose pilot authorization must surrender the authorization to the Administrator within 7 days after the date the authorization terminates.